Mosaic United CEO Rabbi Benji Levy shared his vision for the organization with an audience of around 1,500 at the 2018 Annual Jerusalem Post Conference on Sunday, April 29. Levy spoke about the historic significance of Mosaic United, moderated a panel of three female student speakers and, with President of the World Jewish Congress Ronald S. Lauder, bestowed the inaugural Mosaic United Awards. Rabbi Benji Levy presents Mosaic United at the Jerusalem Post Annual Conference. By leading these innovative and successful programs throughout the world, we will be able to ensure the continuity of the Jewish people and build a stronger Jewish future – together. At the 7th Annual Jerusalem Post Conference on Sunday, April 29, Rabbi Benji Levy delivered an inspiring presentation about Mosaic United, a historic joint venture between the State of Israel and Jews across the globe. Levy, the new CEO of Mosaic United, showcased the organization before a captivated crowd of 1,500 conference attendees. Levy’s presentation began with a short speech explaining that through Mosaic United, the State of Israel is leveraging its position of strength to invest in Diaspora Jewry for the first time. 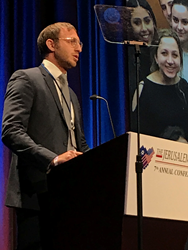 He discussed the organization’s mission to foster connections to Judaism and Israel among young Jews around the world. Attendees then watched a video clip highlighting Mosaic United’s Campus Pillar, an initiative that reaches college students globally through a dynamic partnership with Hillel International, Chabad on Campus and Olami. Following the riveting presentation, Levy moderated a panel of three well-spoken young women who were profoundly impacted by one of Mosaic United’s campus programs. Each student shared a personal story of growth and identity-building. World Jewish Congress President and President of the Jerusalem Post Conference Ronald S. Lauder then joined Levy on stage to present the inaugural Mosaic United Awards to three incredible students who have made a significant difference in Jewish life and connection to Israel on their campuses. The Mosaic United presentation lasted for about 40 minutes and received resounding applause from the audience, enthusing hundreds with the vision for this unique partnership. Strengthening the bond between Jews across the world and the State of Israel, Mosaic United espouses an inclusive approach to Jewish identity as it promotes connections to Israel and to Jewish life. Mosaic United supports initiatives that successfully connect Jews around the world to each other and to the State of Israel. Focusing on Jews ages 13 to 35, Mosaic United seeks to transform a world of growing apathy into one of renewed connection. Mosaic United is an apolitical organization that fosters partnerships with a range of Jewish organizations, helping to unite them and ensure a thriving Jewish people for generations to come.